On February 19, 1942 at 6:00 a.m., air raid sirens sounded over Winnipeg. An hour later, aircraft swooping overhead while anti-aircraft guns fired back. Explosions and small arms fire could be heard around the city. 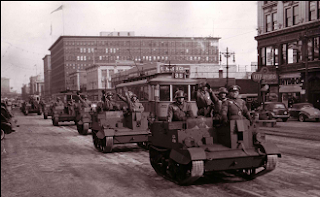 Soon, "Nazi" troops in convoys of armoured vehicles began to seize key points in the city. By 9:30 a.m. they had reached City Hall and arrested Mayor Queen and other city officials. Next, it was to the Legislature and the arrest of Premier Bracken and the Lieutenant Governor. By lunchtime, the city had fallen and was under Nazi control. The Nazis set up roadblocks to stop buses and streetcars, demanding that passengers showed identification. The Carnegie Library on William Avenue is sacked and hundreds of books are burned on the front lawn. Churches were barricaded with notices on their doors that religious services were no longer allowed. 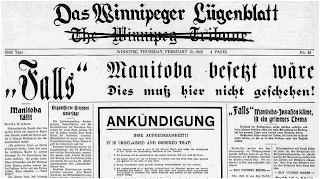 Even the Winnipeg Tribune was targeted. 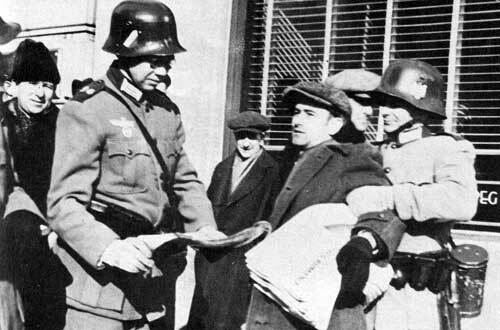 On the morning of February 19, 1942, a special German-language edition of the newspaper is distributed. Just before sunset,the troops gathered on Portage Avenue and began making their way to the city limits. 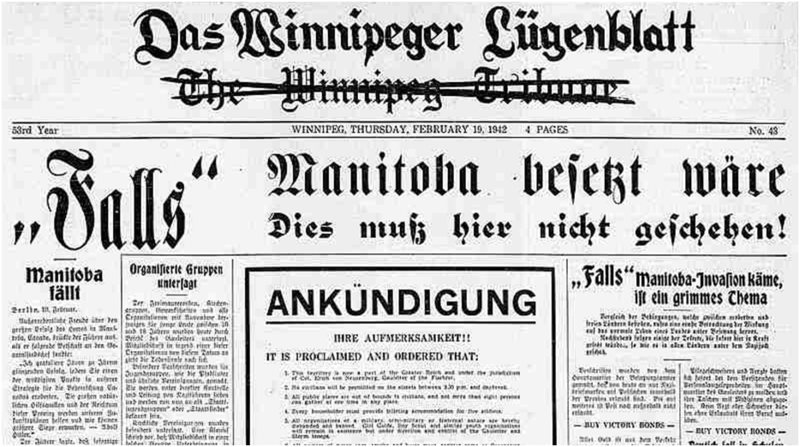 As quickly as it began, the Nazi invasion of Winnipeg was over. The "invasion" was called "If Day", as in what might happen IF the Nazis weren't stopped overseas. It was a publicity stunt involving thousands of volunteers meant to raise funds for Manitoba's Victory Loan campaign. The campaign was a huge success. In the 24 hour period after IF Day, the Manitoba Victory Loan campaign raised over $3 million, (that's almost $43m in 2011 dollars). It also received worldwide media attention from outlets like British Pathé, the New York Times, Christian Science Monitor and LIFE Magazine, which gave it a three page photo spread. I was travelling in the deep south of the US when I saw that CBS Sunday Morning bit - that unexpected taste of home really caught me by surprise!